Some games are dangerous. There was no mobile round-up last week, because Triple Town monopolised my time to the point that I’d not played the rest of the games I was intending to write about. So: onto the games that I should have written about last week. In an App Store full of cartoon-cuteness, it’s surprising that more games don’t try to stand out by being differently lovely to look at. Like Sir Benfro here, with his gorgeous eye-nugget of a world, the tone to my mind recalling Wes Anderson as much as the stated influences of the likes of Terry Gilliam and Studio Ghibli. Which is a good thing. It’s so successful, in fact, that a picture book based on his travels is already in the works. As a game, it’s not quite as interesting. Exploring the four worlds uses a tried and tested mechanic: tap and hold to float upwards, release to drop. 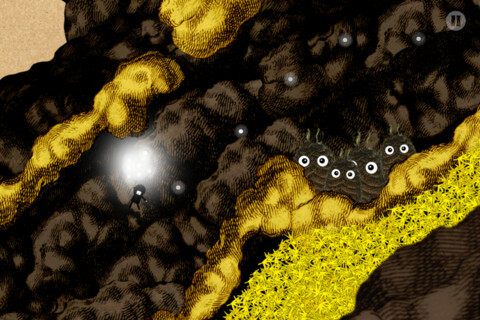 You have to collect the ‘hilariously’ named Light Emitting Daves – which make a sound which might as well have been lifted from LocoRoco – to keep floating, and bumping into the scenery or monsters causes a further loss of Daves. It’s passably entertaining, but the balance is slightly off. It’s too easy to get stuck on an obstacle, losing all your Daves in the process. With long levels which require a modicum of memory, this can be a touch tiresome. But it really does look ruddy lovely. For visual nourishment alone it is emphatically worth 69 pennies. Apparently, Facebook games aren’t all rubbish. This is, quite genuinely, news to me. Shameful, I know, but there it is. 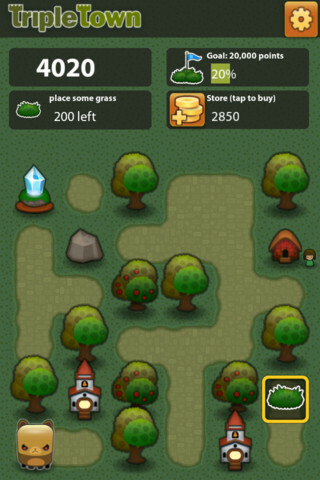 The proof is Triple Town, frankly one of the most inspired ideas in years. I love a bit of match-three, but that’s ingeniously turned on its head here. Placing three or more matching items on your town map not only removes them, but replaces them with an evolved item where you put the final one. Grass becomes hedges becomes trees – it goes on. These evolved items can too be matched, and so it continues. Cue much mental gymnastics to work backwards four or five evolutions. It’s fantastically intricate. Bears complicate matters by wandering around, getting in the way. But they can be turned into gravestones by trapping them in a space, and these can be matched to turn into churches – and so on. Later, ninja bears are even worse, as they can’t be trapped. But robots can be used to destroy any item, and there are crystals to use as wildcards. Plus a shop for when you need it, where you can spend coins earned or bought. And it’s free, for God’s sake. That gives you limited – though quite generous – moves, which replenish over time. But if you’re not willing to spend £2.49 (on iOS at least) to unlock infinite moves by the time you need them, then you’re just being difficult. As even Nintendo would admit, WiiWare hasn’t exactly been a rip-roaring success. 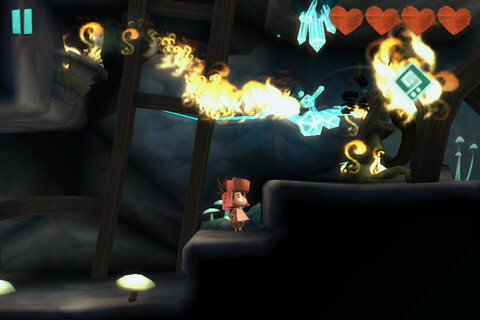 But it has been peppered with highlights, one being 2008’s LostWinds. An adventure game with vague nods to the likes of Zelda and Metroid, the core mechanic of creating gusts of wind makes it a good candidate for a touchscreen conversion. For the most part, it’s a very successful job. The intriguing, but manageable, unravelling game world definitely helps in the mobile suitability stakes, and the wind-based puzzles – which variously involve water, fire, boulders and the like – are no less charming. The controls have been tweaked in an update since release, but I’m not convinced that a game converted to rather than designed for a touchscreen is ever going to feel absolutely right. Nevertheless, drawing a gust of wind to carry Toku over a chasm is a delight, and movement by tapping areas of the screen is effortless. Other than the awkward combat, it’s just when fine accuracy is required that it falls short, probably nothing more than an inevitable result of a fat finger on a reasonably small screen.